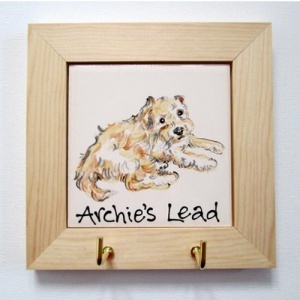 These ceramic dog lead hooks make the perfect personalised gift for yourself or the dog lover in your life. 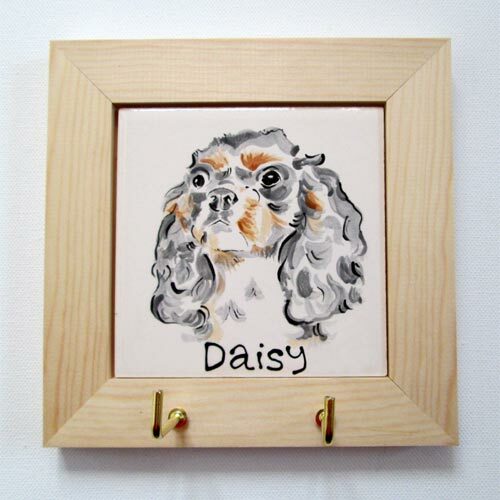 Beautifully hand painted in a pottery studio near Cheltenham, each lead hook features a stylised portrait of your dog painted in the artists own unique style from the photo you provide. 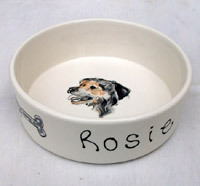 The dog’s name will also be painted, making it truly unique to your dog. Simply enter your personalisation and upload your photo when you place your order. 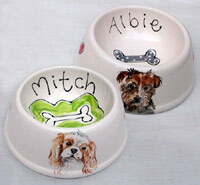 Your dog's stylised portrait and name will be painted just for you, carefully by hand. No transfers or cheap shortcuts. Made from 4 inch ceramic tile which is hand painted and then glazed and kiln fired for a lasting finish. The tile is mounted in a 2 inch quality light wooden frame. 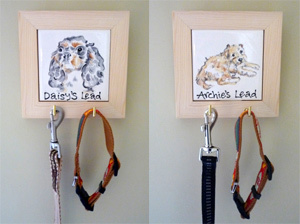 Two brass hooks are attached at the bottom for hanging your dog’s collar, lead etc. Also attached on the back is a hanger so it is ready to be hung on your wall. Measures approx. 6 x 6 inches in total.